Editors: Muehlbauer, Matthew S. and Ulbrich, David J. 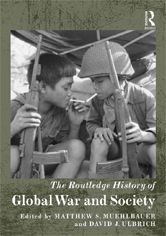 The Routledge History of Global War and Society offers a sweeping introduction to the most significant research on the causes, experiences, and impacts of war throughout history. This collection of twenty-seven essays by leading historians demonstrates how war and society studies have dramatically expanded the chronological, geographic, and thematic breadth of the field of military history.